The European Central Bank (ECB) decided to hold its benchmark interest rate at 0.05%, but announced it is to embark on an asset buying program. The Governing Council of the ECB, which met on Thursday in Naples, Italy, has also decided to keep the interest rate on the marginal lending facility at 0.3% and the rate on the deposit facility at (minus) -0.2%. Mr. Mario Draghi, President of the ECB, said the Governing Council agreed on the key details regarding the purchase of simple and transparent asset-backed securities (ABSs) and a broad portfolio of euro-denominated covered bonds. Update October 5, 2014: Hans-Werner Sinn, President of the Munich-based Ifo Institute says the ECB’s plan to buy covered bonds and asset-backed securities will turn it into a bail-out authority and Europe’s bad bank. He added that it is beyond the ECB’s madate to buy such risky assets. 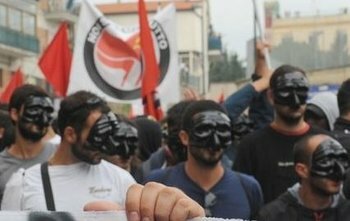 The Governing Council meeting took place in Naples, Italy, where protestors, angered by austerity measures, unemployment and poverty, clashed with riot police. Mr. Draghi said the central bank will start purchasing covered bonds in October and the other assets during the final quarter of 2014. He added that the program will last about two years. The aim is to inject liquidity into the financial system, bolster lending and give the Eurozone’s weakening economy a kick start. Investors were disappointed with the Governing Council’s decision, which they felt did not go far enough to revive the currency bloc’s faltering economy. Mr. Draghi signaled that the total stimulus may not be as large at the €1 trillion ($1.3 trillion) he had mentioned before. The lack of a target sparked comments of another opportunity missed. According to Mr. Draghi, the ECB wants to steer the ECBs assets towards its early-2012 level of €3 trillion compared to the current €2 billion. He urged investors not to place too much emphasis on the exact size of the balance sheet; a comment that triggered sighs of exasperation. London’s blue-chip FTSE 100 Index fell 1.7% on Thursday to 6,446.39 points, the lowest closing level in 2014, on disappointment at the ECB’s stimulus measures. Investors were disheartened that Mr. Draghi gave no specifics on how much the ABS-buying program would amount to. They were also dismayed that no hints were given about extra measures, such as quantitative easing.